Flora's Fury: How a Girl of Spirit and a Red Dog Confound their Friends, Astound their Enemies, and Learn the Importance of Packing Light by Ysabeau S. Wilce. Review: Jump into a magical adventure! Flora's Fury, written by Ysabeau S. Wilce, is the third book in a series of books about Flora Fyrdraaca, who is a young girl from a magical country called Califa. While reading this book, you will encounter all one can ask for: magic, mystery, and adventure. Make sure to pick up this book before you leave the library! The main conflict in this action-packed book is that Flora is trying to find her true mother, who was supposed to have been killed by the evil Birdie overlords of Califa. Along the way, she meets Sieur Wraathmyr, an arrogant merchant who always seems to be getting in her way to finding her mother, Tiny Doom. Eventually, Flora learns to work with him and the two become friends. Together, they escape to the pirate island of Barbacoa. On the island, Flora meets her friend Udo who has accidentally been turned into the legendary troublemaker Springheel Jack. With the help of an octopus ghost and a pig, Udo attempts to win a battle against the evil Birdie who can turn himself into a panther, Espejo. However, Espejo runs out into the rain as a panther and starts running to Arivaipa Territory, where Flora believes Tiny Doom is hiding. Trying to beat Espejo to Arivaipa, Flora must travel via express mail. Who will reach Arivaipa first? Will Tiny Doom be everything Flora hoped? To find out, you must read the book! 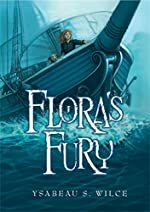 I recommend Flora's Fury to middle school age people who like to read about adventures and supernatural occurrences because it might not be understood very well by younger people. However, it is a great idea to read the first and second books in the series before reading this book, in order to understand the events better. Have a great time reading this book! We would like to thank Houghton Mifflin Harcourt for providing a copy of Flora's Fury: How a Girl of Spirit and a Red Dog Confound their Friends, Astound their Enemies, and Learn the Importance of Packing Light for this review. Have you read Flora's Fury: How a Girl of Spirit and a Red Dog Confound their Friends, Astound their Enemies, and Learn the Importance of Packing Light? How would you rate it?